Jihad Watch : No problem. Pope Francis can just step out of his luxurious apartments, embrace the Islamic State jihadis, kiss their feet, and explain to them that authentic Islam and the proper understanding of the Qur’an reject every form of violence. Then they’ll share a hearty laugh over their former misunderstanding of Islam, and all will be well. 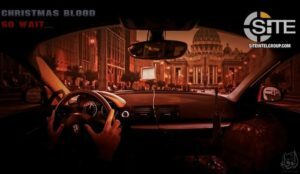 “ISIS’ Christmas threat to the Pope: Terror group threaten vehicle and gun attack on the Vatican,” by Chris Kitching, Mirror, November 14, 2017 (thanks to The Religion of Peace): The terror group ISIS has made a chilling threat against the Vatican just weeks before tens of thousands of faithful gather there to celebrate Christmas. A pro-ISIS propaganda channel made the threat in a poster depicting a car attack. 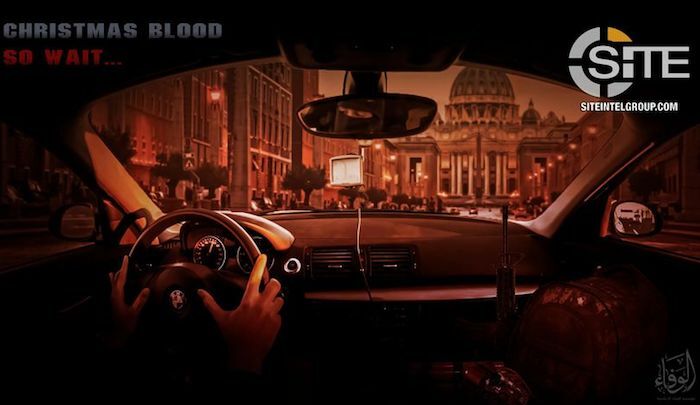 The poster – reading “Christmas blood” – depicts a masked jihadi driving a BMW towards St Peter’s Basilica, where Pope Francis holds mass. An assault rifle and a rucksack are visible on the seat next to the driver, who is using a sat nav and driving at high speed.